Instead of telling more stories about being chased by crocs on the beaches, swimming with deadly box jellyfish or watching aborigines throw boomerangs and play didgeridoos, we thought you might like to hear about the people we are traveling with in the Blue Water Rally. Most of the people in the Rally have taken 2 years away from their jobs and careers to sail around the world with a group of like-minded people. Once the Rally is finished, life will be resumed, just with a 2 year gap that has been filled with a wondrous adventure! 11 countries are represented in the Rally: United Kingdom, Scotland (they consider themselves separate from England), Ireland, Sweden, Spain, Iceland, Holland, Australia, New Zealand, Canada and the USA represented by us. The UK accounts for most of the Rally people simply because the Blue Water Rally is managed from England. David and Susan (this is Susan in the picture with Pete - see below) are from Scotland and sail Enchantress together. It took us several months to finally understand their accents and their language! David and Susan love to invite us and other Rally people onto their 40 foot boat to have sundowners. Watching the big orange orb slip into the sea takes on a new meaning with David and Susan because this occasion is followed by a wee dram. That means whiskey, as any Scottsman knows. Coming from the world's best whiskey country David has more whiskey onboard his boat than he has diesel for his engine. This is not your Wild Turkey whiskey either but the best whiskey money can buy, single malt, made in Scotland of course. Maria and I have not quite developed a taste for this deadly drink, as yet! Gaultine III is owned and sailed by Stuart, Lou and Caroline from Australia. Gaultine III is by far the most interesting boat in the Rally, not only because it is the largest boat at 60 feet. Stuart is married to Lou and they sail together on certain segments while Caroline then joins the boat and sails the next leg as Lou departs. Sometimes all three of them sail together. Stuart is very attentive to both of the ladies whenever they are together. It is quite an arrangement to say the least. 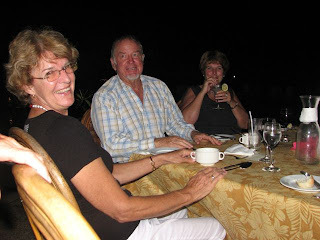 Stuart and the ladies finished their around the world voyage once they made landfall in Australia with us, many years after they originally set out from Australia. By the way, Stuart is 70 years young but the ladies are in their 50's. We will miss having Gualtine III in the Rally now! 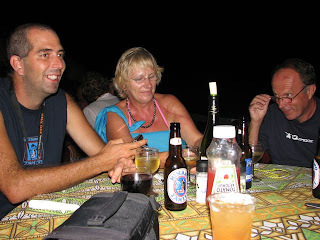 Pete (in the picture with Susan above) and John and Jeremy on Fai Tira are sailing together and they are from the UK. 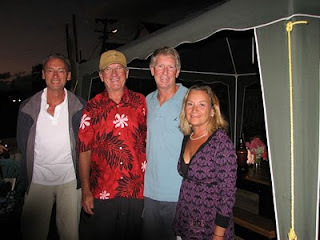 Pete and John own the boat together and Jeremy is a friend who sails with them. No, they are not gay as they always announce whenever they are introduced. Their wives join them every few months to sail a short portion of the Rally route with them. Their boat is a 40 something steel boat that has a tendency to hit reefs and lie on it's side in the mud when the tide goes out. Pete has an eye for the ladies and is the most entertaining person on the Rally! John is a vegetarian so living onboard a boat where two people eat meat and one doesn't makes for some interesting meals. Michael and Ger on Simanderal sailed as far as Australia and will probably join the next Rally as it comes through to resume their voyage back to the Mediterranean. Michael is from Scotland and Ger is the representative from Ireland. Michael and Ger have the fastest boat in the Rally and sail it with amazing skill. Their boat is a 45 foot Swedish built boat and it is lightning fast. The Swedes have perfected the art of building ocean sailing yachts and their boats are second to none. They crossed the Pacific Ocean in 2nd place, making landfall mere hours after the fastest catamaran arrived in the Marquesas. Ger is as tall as Maria with sparkling Irish eyes and is always searching for the best menu's at each port. Just ask Ger where to eat and you won't go wrong! Maria and Ger usually think alike when talking about food. Steve and Katrin (on the right) on Island Kea have a 49 foot sailboat that needs a new engine. They just replaced their generator (that was expensive) and they now hope their engine keeps running until they get to the Mediterranean. Katrin is from Iceland so hearing her sing happy birthday in Icelandic is a real treat! It seems that her family lives right next to an active volcanic vent so they have plenty of hot water all the time. Tom (see below) sails on Island Kea. There is Tom who is from southern England. Tom is also known as Ocean Hippie. Tom crews on any Rally boat that needs him. He had already sailed around the world once as crew on another person's boat and joined this rally to do it again, well, partially. Tom decided that he is slowly running out of beer money so he will stop in Australia and work for a while and then probably catch the next rally as it comes past. Tom is the consummate computer geek. He can crack, fix or destroy most anything to do with computers. He is a lifesaver for us on the Rally when we need computer help. If you buy Tom a beer or 3 he is most happy working hours on end to solve your problem. 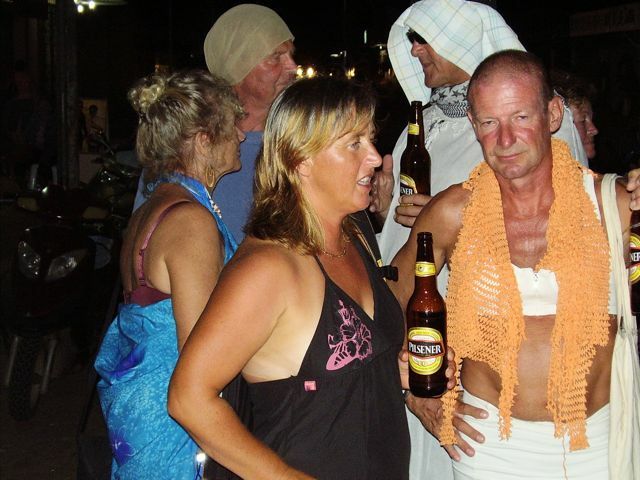 Hans and Monica (the couple in the front right of the photo) are from Sweden and sail a Swedish catamaran named Nati Bou. Yes, they are the fastest boat in the Rally and Hans races trimarans and catamarans. His last boat was a high-tech trimaran that he managed to turn upside down when he sailed too fast and hit a big wave. The boat was destroyed and Hans decided to get a less high tech boat for this voyage. His wife Monica is an excellent sailor as well and managed to retrieve one of their cockpit cushions when it flew into the turbulent water between Fiji and Vanuatu. As Hans backed the boat up to the cushion in mountainous seas Monica nearly went for a swim but managed to hold on and save the cushion. Hans speaks excellent English because he was an exchange student who went to high school in Nebraska - Captain Steve's birthplace! It is a small world. Then there is Duco on Briet from Holland (no photo). Well, Duco actually lived in Australia where he was a professor who taught engineering and it was in Australia that Duco joined the Rally and it is where he finished with us. Duco could fix anything electrical on your boat. 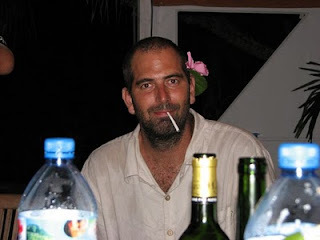 He fixed Aspen's autopilot in Vanuatu so that we could sail to Australia. Duco has the smallest boat in the Rally at 34 feet. Duco also had the most electrical problems because when Aspen was knocked down, Duco's boat was also knocked down but his entire boat was flooded in the process and all of his electronics shorted out! It was quite a mess and Duco is still replacing the electronics on his boat. 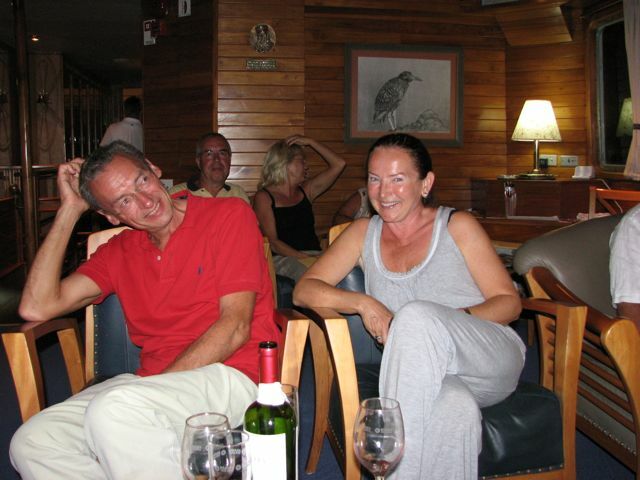 On our trip so far, Maria and Captain Steve have been able to learn a new language (English), appreciate the flavor of whiskey, learn advanced sailing techniques, learn how to fix everything and anything on our boat and travel with Gaultine III. What an adventure this has been so far and more is awaiting us!